Posted by jeremyliew in social media, social networks, user generated content, web 2.0. Earlier today Om reported that Hi5 has raised $20m from Mohr Davidow. As Techcrunch points out, Hi5 is ranked by Alexa as 11th globally, higher than Facebook. Mashable notes that Hi5 claims 30 million members and 200 million pageviews/day, big numbers, but mostly in non-English speaking countries. Congrats to both Hi5 and Mohr Davidow. This news prompted me to take a look at what are the most engaging social networks for US users. 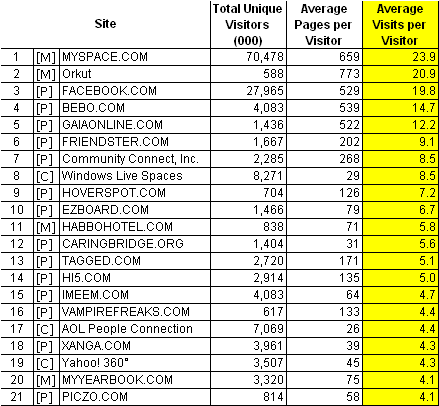 Comscore lists 174 sites in its social networking category. I ranked the sites by two key measures of engagement (i) pageviews per user per month and (ii) visits per user per month. I then stripped out all sites with less than 500k US unique users per month. Its interesting to see that Orkut, generally thought of as a Brazilian and Indian focused site, has more pageviews per user per month from US users than even MySpace and Facebook. Myspace continues to dominate Facebook on all three key metrics, suggesting that reports of MySpace’s death are greatly exaggerated, Facebook apps notwithstanding. There is also a pretty marked step between the top 5 sites (500+ PV/UU/mth) and the next 6. Two sites that made both lists were unfamiliar to me; hoverspot.com and vampirefreaks.com. Hoverspot is a general social networking site that has doubled its user count over the last year according to Comscore, and Vampirefreaks is a goth/industrial social network. Also noteworthy were four sites with over 500 PV/User/month that didn’t make the first list because they had less than 500k UU/mth; Shoutlife (a christian social network), Cyworld (the US arm of the wildly successful Korean social network), Mocospace (a mobile social network) and Cherrytap which appears to now be redirecting to Fubar.com and calls itself the first online bar (and seems to mostly be about meeting people). They show that you don’t have to have a large audience to drive high engagement. UPDATE: Some readers in comments have questioned whether Pageviews per user per month is a good measure of engagement since some sites use Rich Internet Application (RIA) technologies such as AJAX that reduce pageviews. I recut the analysis using time spent instead of pageviews and it looks like the top social networks by time spent are largely the same (follow the link for details). Thanks for providing some statistics and highlighting some more metrics than user count and growth rate. Not that there is anything wrong with facebook, but it helps to put the recent facebook craze (Scobleizer anyone 🙂 ?) a little bit more into perspective. To suggest that Page Visits is the measurement of Engagement isn’t a great idea. A user could be engaged with a website and it won’t be measured. Also if any of these websites had RIA or an aggregation type of page, they could be consuming a great deal of content and interacting with others without moving to a new page. Nice meaty post Jeremy. 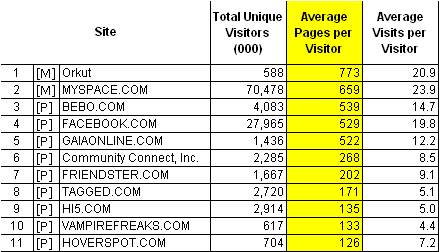 What I find interesting is the number of visits per user. All of these sites seem to be engineered to pump up their pageview metrics so I’m always a bit skeptical on the PV and avg visit per user. I like the unique user metric the best. It would be good to have some more useful metrics that discounted poor design, and maybe focused more on profile and photo album views (instead of one page per photo), messages exchanged (one view per IM session rather than > 10), etc. What’s the time frame on this data? I’ve seen a lot of Facebook analysis this summer and a lot of people are forgetting to mention that the site’s core users, college students, aren’t on campus at the moment, which is surely driving down their key metrics. This isn’t a comment about your analysis (which seems spot on), but a question of the metrics methodology: is Comscore/Alexa/whoever actually getting accurate data from mobiles for sites like Mocospace? What are you using as your data source? Why no mention of time spent on site? very interesting article! Also, learned a thing or two about some social networking sites I had never heard before! What’s the source of the usage statistics and how accurate is it if you know? any time-on-site stats to compare? PV’s can be gamed / manipulated fairly easily… i think i’d believe combination of time-on-site + sustained clickstream as better indicators. Yawn. A lot of these guys artificially inflate page views. If social networks are really that valuable, they should sell their own products and show everyone that advertising on them can actually pay off. Until then, I’m sticking to PPC ads. I’ve often wondered about the quality of ComScore’s data vs. Nielsen//NetRatings. Is ComScore more reliable? How do you think the high number of users outside of the U.S. affects (or doesn’t affect) the ability for sites to make money off U.S. advertisers? There seems to be a high number of international users on all of the sites. I’ve always been curious about whether or not this impacts the ability to generate revenue. Facebook may not generate as many page views as MySpace view visitor, but I believe that’s because it’s more efficient to use it, which could lead to better user satisfaction and growth over time. Regardless, it’s an interesting snapshot of where things are today. @ Michelle – I don’t know if Comscore is more reliable or not – its just what I have access to! I’m also very curious about analytics. Business Week had an article not long ago on it and it had more or less said that there isn’t any one really solid source for accurate numbers. I understand that ajax and video are disrupting/will disrupt it further, also. I’d love to see more people talking about this stuff, how it works, what’s being developed, etc. Nice work Jeremy. Definately helps give a picture as to what is going on. Since there are no definitive status on usage, I think your approach is reasonable as long as taken with a healthy grain of salt. I think it’s fair to say that no matter what stats you show, critics are bound to jump up disagree with your methods. Whilst Vampirefreaks.com (VF) does use PPC ads from Google, a lot of it’s revenue is gained from it’s sister site Synth-Tec.com (also known as f**ckthemainstream.com). This is only advertised on VF, so I would say that social network sites CAN be valuable, so long as the product/s you are selling are in tune with your captive audience. This was a very informative post. How does one get access to the ComScore data? Karan – you pay Comscore a lot of money! Could VOIS.com become another Facebook? Since the advent of social networking sites in 1997, the phenomenon has taken the world by storm. Once called a passing fad social networking is now a thriving business, in 2006, alone it garnered over $6.5 billion in revenue, while the three biggest players, connected over 280 million subscribers in a way never known before to society. This form of connection has drawn the globe closer together than anyone ever predicted. Just a few years ago, MySpace.com, solely dominated the social networking site market with almost 80% of the social networking site market but now websites like Facebook entered the social networking site race becoming the 8th most viewed website in the U.S. according to web measuring traffic site Alexa.com. Facebook.com which originally started at Harvard University , later extended to Boston area schools and beyond has mystified many naysayer’s with its explosive growth over the last three years and an astounding asking price of $10-$15 billion dollars for the company. But who will be next? Who will carry the torch into the future? With the rapid growth of the likes of MySpace and Facebook the burning question on everyone’s tongue is who is next? As with any burgeoning field many newcomers will and go but only the strong and unique will survive. Already many in the field have stumbled, as indicated by their traffic rankings, including heavily funded Eons.com with its former Monster.com founder at the helm, Hooverspot.com and Boomj.com with its ridiculous Web 3.0 slogan. There are many possibilities but it is a dark horse coming fast into view and taking hold in the social networking site market at the global level that has us interested the website – Vois.com. Less than a year ago, this newest contender directed at 25 to 50 years olds graced the absolute bottom of the list with its website ranked at a dismal 5,000,000. With not so much as a squeak this rising star has come from the depths of anonymity growing an eye-popping 10,000% in less than one year to make itself known worldwide now sporting a recent web traffic ranking in the 5,000 range. When people in the United States hear about Facebook and other services such as MySpace the widely held belief is that these websites are globally used and are as synonymous as Google or Yahoo in regards to having a global market presence. This idea is completely misguided. Now it is true that both of these social networking giants are geared to service the western industrialized cultures but when it comes to the markets of the future, the emerging markets, they have virtually no presence. The sites themselves are heavily Anglicized, and Facebook in particular has an extremely complicated web interface that eludes even those familiar with the language, making them virtually inaccessible in other parts of the world even where English is the main language. Our interest in Vois is global and geopolitical. Simply, Vois understands this lack of market service and is building its provision model on a global research concept developed by Goldman Sachs a few years ago. The concept is basically predicated on the belief that beginning now using current economic models and continuing those models over the next few decades will lead to a major paradigm shift in the world regarding nations who are current economic leaders like those being the USA and the other members of the G-7 and those who will become dominant in the world economy mainly the BRICs. In the Goldman research report Goldman highlights the fastest growing nations and has dubbed them with the two acronyms BRIC’s and N-11. BRIC standing for ( Brazil, R ussia, India and China) representing the fastest growing economies and N-11 or what are being called the Next-11 representing the next 11 countries to emerge as future important economies such as Bangladesh, Egypt, Indonesia, Iran, Korea, Mexico, Nigeria, Pakistan, Philippines, Turkey and Vietnam. This approach has already been implemented with some success with companies like Orkut, who has over 80% of the market share in Brazil and large holdings in India and Eastern Europe . Other providers such as Hi5 have the world as their focus and are making great strides in global market share while Facebook builds itself into a niche provider wholly unready to take on the world. As Vois breaks new ground in the world market pursuing previously ignored demographics, they afford themselves the opportunity of tremendous growth unfettered by the giants such as Facebook and MySpace. While cultivating this new user base, Vois will also be able to monopolize on their business revenue strategies, creating an area of commerce that will make their site increasingly attractive to business and users the world over. This concept, dubbed sCommerce, allows the subscriber to promote themselves in both personal and a professional fashion while giving them the option of setting up shop on the site. This approach will allow business owners to target their market in a way never before allowing them to focus on interested groups of individuals while providing follow-up without having to commit to wasteful blanket campaigns that are typically the order of the day. This newfound border will allow Vois to explore new revenue models while provide a tremendous service for both their regular subscribers and business subscribers alike. With all this going on, rapid traffic growth to the site, we pose the question – is Vois the next Facebook, it sure looks like it but only time will tell…. I use both Myspace and Facebook to advertise my wedding businesses and are seeing great traffic from both sites. As all of these individual sites grow, I think there is going to be a large opportunity for companies that can produce apps that can operate cross platform, especially in the communication area. Tying together all of these sites presents a large growth area..imo. We have a new online social networking website, http://www.WheresYourWorld.com. A community website dedicated to recreations hobbies and Free to join!!! When a recreation or hobby is chosen, the pages dynamically change for your selection. Online Social Network Dedicated to Food & Wine Lovers Garlicoon, an online community for people who love good food and wine launches new website. May, 2008 – http://www.garlicoon.com is a social network designed exclusively for individuals interested or involved in the world of Food & Wine. — Garlicoon provides an online, interactive forum for individuals who are passionate about Food & Wine and enables members to: — Network with other Food & Wine lovers, build personalized pages of data about themselves with a familiar Web 2.0 interface. — Share videos and photos. — Garlicoon allows members to control who may access their private data and ensures that all interactions between members, such as video and other file sharing, are secure and received only by those to whom they are intended. — Garlicoon allows upload and playback of high quality videos. — Garlicoon membership is open to everyone with a valid email address. This is an old post but should be brought to attention. That list has changed so much!